A pressure sensor gives the pressure based on capacitance change, which is related to the deformation of the structure. Deformation depends on the ambient pressure and temperature, on the materials used, and on any initial stresses in the material. The design and modeling of microelectromechanical systems (MEMS) is a unique engineering discipline. At small length scales, the design of resonators, gyroscopes, accelerometers, and actuators must consider the effects of several physical phenomena in their operation. 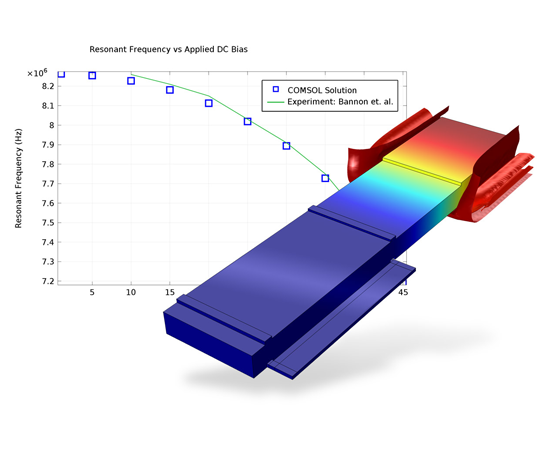 Consequently, COMSOL Multiphysics is ideally suited for MEMS applications. To this end, the MEMS Module provides predefined user interfaces with associated modeling tools, referred to as physics interfaces, for a variety of coupled physics, including electromagnetic-structure, thermal-structure, or fluid-structure interactions. You can include a variety of damping phenomena in your model: thin-film gas damping, anisotropic loss-factors for solid and piezo materials, anchor damping, and thermoelastic damping. For elastic vibrations and waves, perfectly matched layers (PMLs) provide state-of-the-art absorption of outgoing elastic energy. Best-in-class piezoelectric and piezoresistive modeling tools allow for simulations where composite piezo-elastic-dielectric materials can be combined in any imaginable configuration. The MEMS Module includes analyses in the stationary and transient domains, as well as fully-coupled eigenfrequency, parametric, quasi-static, and frequency response analyses. You can easily perform lumped parameter extraction of capacitance, impedance, and admittance, and connect to external electrical circuits via SPICE netlists. Built upon the core capabilities of COMSOL Multiphysics®, the MEMS Module can be used to address virtually any phenomena related to mechanics at the microscale. ELECTROSTATICALLY ACTUATED RESONATORS: A simulation of an electrostatically actuated MEMS resonator using the Electromechanics interface of the MEMS Module. QUARTS RESONATOR: The mechanical response of a thickness shear quartz oscillator, together with a graph showing the effect of a series capacitance on the frequency response. THERMAL ACTUATOR: The temperature within a displaced, Joule-heated thermal actuator is shown at the top while the visualization at the bottom shows the current density distribution. PIEZORESISTIVE SENSORS: The stress field in a piezoresitive sensor computed with the built-in physics interface for piezoresistive materials in the MEMS Module. THERMOELASTICITY: Thermoelastic damping is an important factor when designing MEMS resonators. The cyclic deformation of the resonator creates local temperature variations and thermal expansion of the material, which appears as damping. To model a MEMS device, you first define the geometry in the software, either by using the native modeling tools of COMSOL, or by importing a CAD model. If you want to import mechanical CAD models, you can do so by using the CAD Import Module or one of the LiveLink™ products for CAD. Electronic layouts can be imported with the aid of the ECAD Import Module. Once the geometry model is defined, the next step is to select appropriate materials and add a suitable physics interface. Initial conditions and boundary conditions are to be set up within the interface. Next, you define the mesh and select a solver. Finally, you visualize the results and process and export the results. All of these steps are accessed from within the COMSOL Desktop®. The solvers are set up automatically with default settings, which are already tuned for each specific interface. However, the advanced user can access and modify low-level solver settings as needed. You can also integrate your MEMS simulations with Microsoft® Excel®. The LiveLink™ for Excel® allows you to drive simulations from within the Excel® interface as well as import/export of results and materials. If you prefer a scripting environment, the LiveLink™ for MATLAB® makes a series of very powerful MATLAB® compatible commands available when installing COMSOL Multiphysics and MATLAB together. In this manner, COMSOL simulations can be integrated with MATLAB programs. You can export results from a COMSOL model to the MATLAB environment, including inspecting the stiffness and system matrices. Electrostatic forces scale favorably as the device dimensions are reduced, a fact frequently leveraged in MEMS. A typical application of the MEMS Module within this area is for electrostatically actuated MEMS resonators, which operate with an applied DC bias. The MEMS Module provides a dedicated physics interface for electromechanics that, for MEMS resonators, is used to compute the variation of the resonant frequency with applied DC bias – the frequency decreases with applied potential, due to the softening of the coupled electromechanical system. The small size of the device results in a MHz resonant frequency even for a simple flexural mode. In addition, the favorable scaling of the electromagnetic forces enables efficient capacitive actuation that would not be possible on the macroscale. The Model Library that ships with the MEMS Module has detailed tutorials with step-by-step instructions for electrostatically actuated MEMS resonators. Furthermore, you have the option to use the electromechanics interface to include the effects of isotropic electrostriction. Piezoelectric forces also scale well as the device dimension is reduced. Furthermore, piezoelectric sensors and actuators are predominantly linear and do not consume DC power in operation. Quartz frequency references can be considered the highest volume MEMS component currently in production – over 1 billion devices are manufactured per year. The physics interfaces of the MEMS Module are uniquely suitable for simulating quartz oscillators as well as a range of other piezoelectric devices. One of the tutorials shipped with the MEMS Module shows the mechanical response of a thickness shear quartz oscillator together with a series capacitance and its effect on the frequency response. A series capacitance is frequently used to tune or pull the resonance of quartz oscillators, and the MEMS Module allows combining 2D and 3D models with SPICE circuits for such combined simulations. Thermal forces scale favorably in comparison to inertial forces. That makes microscopic thermal actuators fast enough to be useful on the microscale, although thermal actuators are typically slower than capacitive or piezoelectric actuators. Thermal actuators are also easy to integrate with semiconductor processes, although they usually consume large amounts of power compared to their electrostatic and piezoelectric counterparts. The MEMS Module can be used for Joule heating with thermal stress simulations that include details of the distribution of resistive losses. Thermal effects also play an important role in the manufacture of many commercial MEMS technologies with thermal stresses in deposited thin films that are critical for many applications. The MEMS Module includes dedicated physics interfaces for thermal stress computations with extensive postprocessing and visualization capabilities, including stress and strain fields, principal stress and strain, equivalent stress, displacement fields, and more. COMSOL’s design emphasizes the physics by providing you with the equations solved by each feature and offering you full access to the underlying equation system. There is also tremendous flexibility to add user-defined equations and expressions to the system. For example, to model Joule heating in a structure with temperature-dependent elastic properties, simply enter in the elastic constants as a function of temperature – no scripting or coding is required. When COMSOL compiles the equations, the complex couplings generated by these user-defined expressions are automatically included in the equation system. The equations are then solved using the finite element method and a range of industrial strength solvers. Once a solution is obtained, a vast range of postprocessing tools are available to interrogate the data, and predefined plots are automatically generated to show the device response. COMSOL offers the flexibility to evaluate a wide range of physical quantities, including predefined quantities like temperature, electric field, or stress tensor (available through easy-to-use menus), as well as arbitrary user-defined expressions. Fluidic MEMS devices, or microfluidic devices, represent an increasingly important area of MEMS. COMSOL provides a separate Microfluidics Module to specifically address these applications, but the MEMS Module does include significant microfluidic functionality for simulating the interaction of MEMS structures with fluids. The Fluid-Structure Interaction (FSI) multiphysics interface combines fluid flow with solid mechanics to capture the interaction between the fluid and the solid structure. Solid Mechanics and Laminar Flow user interfaces model the solid and the fluid, respectively. The FSI couplings appear on the boundaries between the fluid and the solid, and can include both fluid pressure and viscous forces, as well as momentum transfer from the solid to the fluid – bidirectional FSI. The method used for FSI is known as an arbitrary Lagrangian-Eulerian (ALE). Damping forces from FSI are often important for MEMS devices, frequently leading to a requirement for vacuum packaging. The MEMS module has specialized thin film damping physics interfaces which solve the Reynolds equation to determine the fluid velocity and pressure and the forces on the adjacent surfaces. These interfaces can be used to model squeeze film and slide film damping across a wide range of pressures (rarefaction effects can be included). Thin-film damping is available on arbitrary surfaces in 3D and can be directly coupled to 3D solids. The piezoresistive effect refers to the change in a material’s conductivity that occurs in response to an applied stress. The ease of integration of small piezoresistors with standard semiconductor processes, along with the reasonably linear response of the sensor, has made this technology particularly important in the pressure sensor industry. For modeling piezoresistive sensors, the MEMS Module provides several dedicated physics interfaces for piezoresistivity in solids or shells. When combining the MEMS Module with the Structural Mechanics Module, a piezoresistivity physics interface for thin shells is enabled. The Solid Mechanics physics interface is used for stress analysis as well as general linear and nonlinear solid mechanics, solving for the displacements. 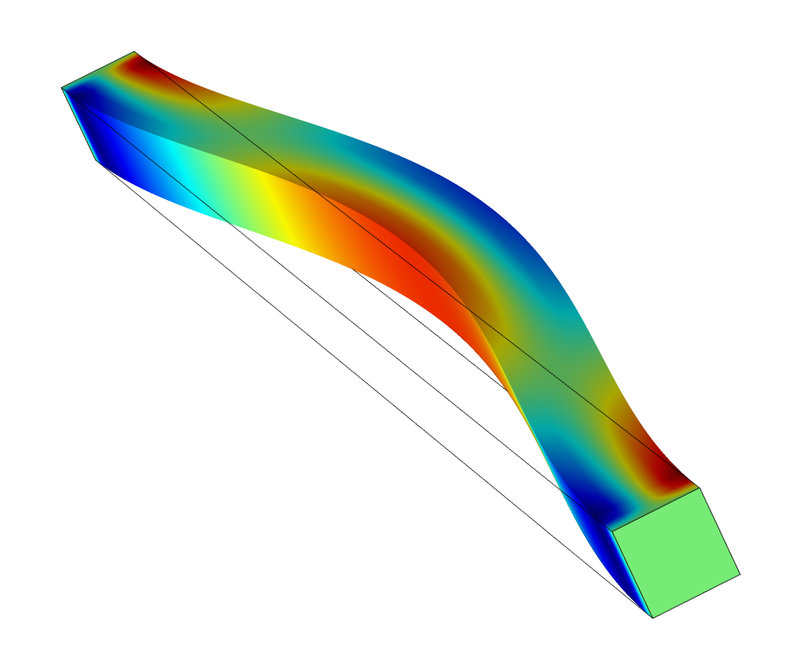 The MEMS Module includes linear elastic and linear viscoelastic material models, but you can supplement it with the Nonlinear Structural Materials Module to also include nonlinear material models. You can extend the material models with thermal expansion, damping, and initial stress and strain features. In addition, several sources of initial strains are allowed, making it possible to include arbitrary inelastic strain contributions stemming from multiple physical sources. The description of elastic materials in the module includes isotropic, orthotropic, and fully anisotropic materials. The Thermoelasticity physics interface is used to model linear thermoelastic materials. It solves for the displacement of the structure and the temperature deviations, and resulting heat transfer induced by the thermoelastic coupling. Thermoelasticity is important in the modeling of high-quality factor MEMS resonators. Microelectromechanical systems (MEMS) are becoming increasingly complex as the MEMS manufacturing technology matures. Consequently, software specifically designed for MEMS simulation and modeling has never been more important. 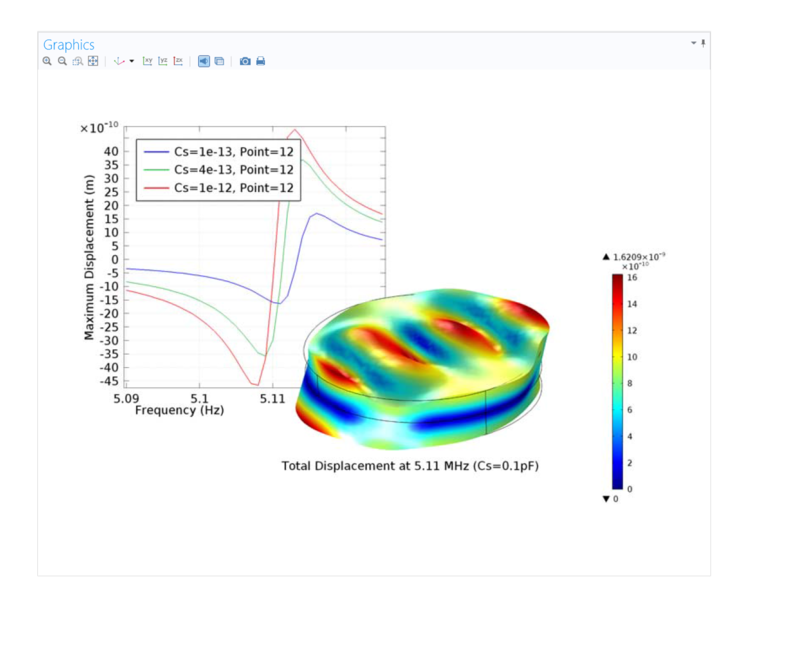 Watch this video to learn how the MEMS Module add-on to COMSOL Multiphysics provides tools which make the simulation of MEMS devices easy. The MEMS Module is made for simulating multiple interacting physical effects enabling high fidelity modeling of even the most complex MEMS devices. Physics such as electromechanics, piezoelectricity, piezoresistivity, thermal-structure, and fluid-structure interactions can be modeled with the software. Design engineers can easily create models of common devices such as actuators, sensors, oscillators, filters, ultra sonic transducers, BioMEMS, and much more. Try the software: Get a free 2-week trial by signing up for a workshop in a location near you. The model performs a static analysis on a piezoelectric actuator based on the movement of a cantilever beam, using the Piezoelectric Devices predefined multiphysics interface. Inspired by work done by V. Piefort and A. Benjeddou, it models a sandwich beam using the shear mode of the piezoelectric material to deflect the tip. The elastic cantilever beam is one of the elementary structures used in MEMS designs. This model shows the bending of a cantilever beam under an applied electrostatic load. The model solves the deformation of the beam under an applied voltage. An electrostatically actuated MEMS resonator is simulated in the time and frequency domains. The device is driven by an AC + DC bias voltage applied across a parallel plate capacitor. The dependence of the resonant frequency on DC bias is assessed, and frequency domain and transient analyses are performed to investigate the device performance. A capacitive pressure sensor is simulated. This model shows how to simulate the response of the pressure sensor to an applied pressure, and also how to analyze the effects of packing induced stresses on the sensor performance.